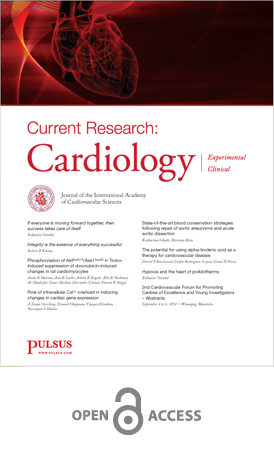 Current Research: Cardiology (ISSN: 2368-0512), an OPEN ACCESS peer reviewed journal which publishes original articles, reviews, case reports, clinical images related to cardiology, disorders of the heart, variety of cardiology and heart health topics, including hypertension, myocardial ischemia, diabetes and other cardiovascular disease. Journal is using online system for manuscript submission, peer-review and tracking of the article. Manuscript acceptance requires approval by at least two independent reviewer’s either from Editorial Board members of the journal or outside experts followed by handling editor.